With today being New Year’s Eve, many are thinking about what they would like to change or what they want to be different in 2019. These are what we call resolutions! The idea of resolutions is one that should be applauded and supported; after all, what better time to commit to making important changes in your life than the start of a new year! 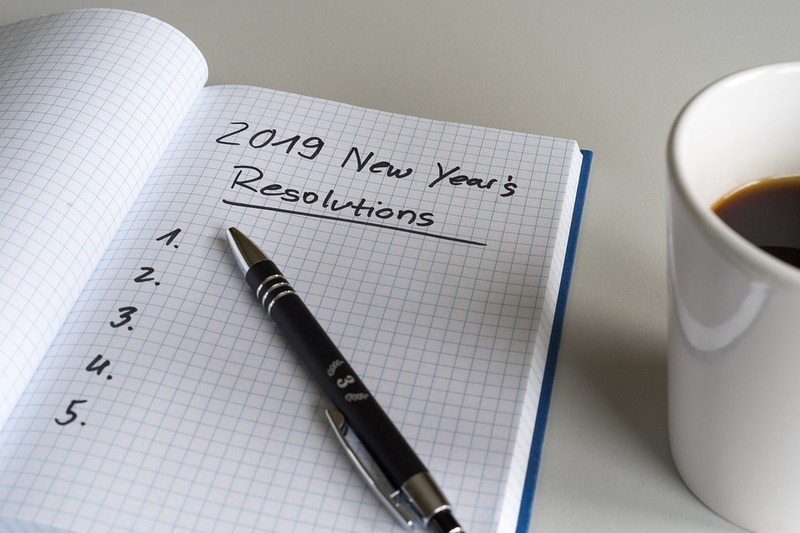 So you may be asking yourself, “what do I want to change this year?” Well, not surprisingly, resolutions come in all shapes and sizes and are not only about weight loss! (Though, weight loss is consistently the #1 New Year’s resolution). As you begin to think about what you want to be different, keep in mind that a resolution can be about anything that you want to be different in your life. In addition to weight loss, other common resolutions include getting organized, saving money, enjoying life more, getting healthy and fit, learning something new, quitting smoking, philanthropy, finding a mate, and spending time with family and friends. The sky is the limit though – maybe you are seeking a specific promotion at work, want to travel more often, live more simplistically, etc. Or, perhaps, you are ready to make much larger, more pervasive and significant changes by working to improve your mental and emotional health. What do I want to be different in my life? What do I want more of or less of in my life? How can I improve myself and my relationships? The start of a new year means a fresh start to make significant changes in your life. However, the disappointing fact is that most resolutions quickly fail, and by quickly I mean 80% of resolutioners have given up and feel disappointed by February. Why does this happen? The answer is simple really: It’s a combination of reduced self-discipline and not making mental changes. Unless you have truly changed your mind and feel ignited for the change from within, don’t expect your goals to materialize. If your initial passion for change is simply a result of holiday gluttony and/or the false belief that “a little bit of effort should yield big changes rather quickly,” you will end up quickly disappointed and are more likely to give up. This is where psychotherapy comes in. At its core, psychotherapy is all about change. When people come to therapy, they are looking for something, or perhaps a lot of things, to be different. They want change. And that is exactly what New Year’s resolutions are all about: change. Therapy is also about figuring out what you want to be different in life and goal setting; with the help of a skilled therapist, you can get where you want to go. Many clients come to Tampa Therapy at this time of year for this exact reason, and it is a beautiful thing. Perhaps you know what you want to change, but you just don’t know exactly how to get there or to sustain the actions needed to make the change. Or, perhaps you have no idea what needs to change, but are plagued by this gut feeling that your life simply isn’t where you want it to be. Therapy can help to clarify what it is you would like to be different and provide you with a plan and the support for getting there. Make sure your goals are realistic. Losing 40 lbs. in one week simply is not. When goals are realistic, you won’t be left disappointed, are able to keep yourself motivated, and are more likely to recognize and appreciate change when it happens. Be specific about what you are wanting to change. Instead of saying “I want to lose weight,” which is far too vague, determine how much weight you want to lose and by when. You are much more likely to achieve your goals if you say “I want to lose one lb. per week by the end of February.” This also allows you to track your progress. Set concrete daily or weekly goals to keep yourself motivated and accountable. For example, determine what you want to work on with your therapist, the number of workouts or meditation sessions per day, ad schedule the activity at a particular time on specific days, etc. Set milestones to measure your success (ex., connecting with loved one as a pre-defined frequency, attending therapy sessions weekly for two months, specific weight goals, timeframe goals, frequency, etc.). Set a timeframe. Just as saying “I want to lose weight” is too vague, saying “I want to lose 4 lbs.” is also vague. Know when you want to have completed your goal. This will allow you to work more steadfastly to the figurative finish line. On a final note, I cannot more sincerely encourage you to reach out to a therapist if you are looking for things to be different in your life. Seriously, try therapy – it works! The most important changes one can make in their life are mental and emotional. In fact, any true and lasting behavioral change is a result of these areas. If you don’t actively work on improving your cognitions and emotions, positive behavioral change simply is less likely to follow, and unlikely to persist. I cannot stress the importance of considering therapy. Give us a call or send us an email, and allow yourself to start 2019 off the way you want your life to be.